GPS devices, which are available today in the market, are more featured concerned than initially launched GPS system. Positioning services offered by these devices are featured with compass navigation along with GPS and altimeter. 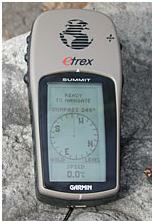 Same like the Brunton MNS device, eTrex summit combines an electronic compass with GPS and altimeter altogether. Same like in Brunton MNS system, Garmin eTrex summit is one of the GPS which is able to work while standing still. All the obligatory GPS features which are found in other GPS devices are available in this. The GPS technology has come long way over the last few years, making it impossible that you will lost anywhere in the world while thousands miles away from your home or country for boating, traveling, hiking or flying. Now the Garmin has taken further steps with launching of its eTrex summit device. Dubbed with title of hiking companion, this small device is just forming all that. When somebody asks you to go for hiking next time, you may ask for eTrex summit of Garmin to take with yourself also. Just like its predecessors, this eTrex summit device from Garmin has been designed according to outdoor use. Total weight of eTrex summit is only 5.3 ounces and featuring 12 channel GPS receiver with altimeter and electronic compass with it. This device has a built-in antenna and also use backlit display which is so sharp to view in any light outside by mere adjustment of its contrast. But when your eTrex device is in backlit mode, its battery will decrease significantly, though users have been facilitated to set timer for saving power and avoiding the overuse of it. The eTrex summit can also save up to 500 way points with 29 icons to mark coordinates and best for creation of auto logs when you are navigating. Important information like time, elevation and position will automatically save once you navigate on the map and store these points in track back mode. Once you have activated the trackback service, it will automatically trackback you to your original location with compass moving ahead for right or left navigation. The eTrex system is not only waterproof and hard for any resistance but also it has a trip with elevation computing system to measure the average and current speed, remaining distance, time required or trip distance, total rate of elevation and descent or ascent rate. You can scroll through the pages for getting information of imperative GPS.